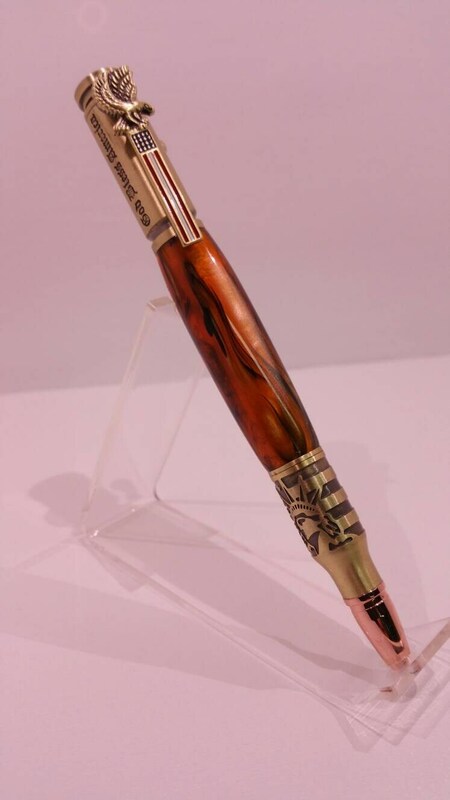 The hand crafted Statue of Liberty pen is finished in antique brass with a orange/black acrylic body. This gun themed pen features etched engraving of the Statue of Liberty on the tip. On the top of the pen there is a red white and blue American flag clip with the words "God Bless America" etched next to it. The pen opens and closes using the bolt action lever. Pen is approx 5.5 inches long. Includes slide out gift box as pictured. Item #13. Color of ink is black. Uses standard Parker style refill.